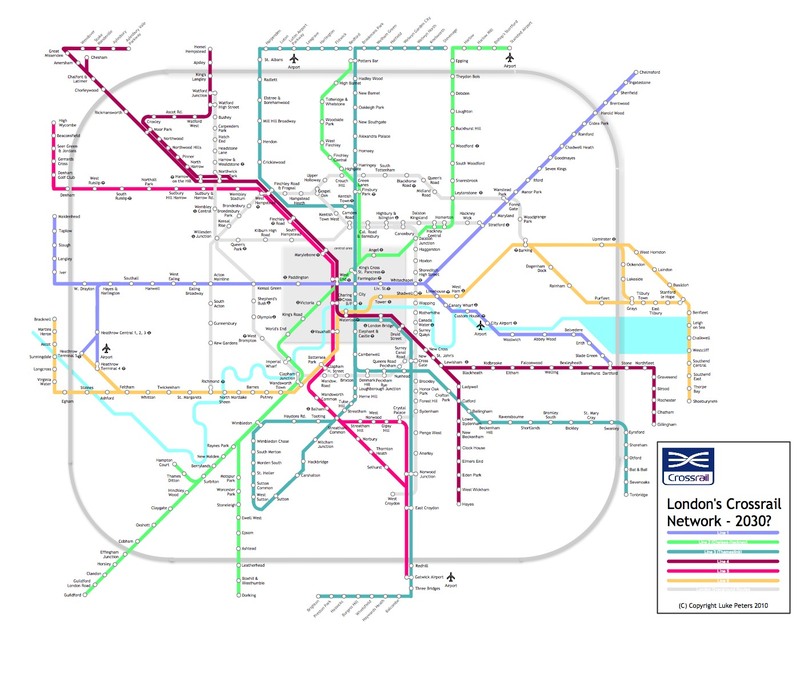 Whilst Crossrail Line 1 is under construction and line 2 is proposed, albeit in ambiguous form, there exist other lines and portions of lines that could be integrated into a wider Crossrail network, including Thameslink, Chiltern Railways to High Wycombe and the Metropolitan line from Baker Street northwards to create a cohesive Crossrail network across the capital, much as the RER, Cercanias and S-Bahn services do on the continent. Greater extent. Not merely urban, or suburban, Crossrail is regional, and connects with outliers and dormitories. Lower station density. Especially in urban centres, Crossrail's greater scope requires fewer stops per mile to improve efficiency. As it stands, Bond Street, Tottenham Court Road, Farringdon and Liverpool Street seems one station too many. Split running. Various branches and routes can be tolerated on Crossrail, more so than on LUL. 1. Thameslink: already performs a "Crossrail-like" function on a N-S axis, albeit with an unusually long extension (new upgrades will see it reach from Brighton to Kings Lynn). Some of the line might be pared back in this scenario. 2. Metropolitan Line: The Met has always been an odd sausage. Conceived as a mainline commuter railway, with a few underground stations in central London. it did for a period operate as far as Aylesbury. I propose routing it under Marylebone station and the West End through Charing Cross and over south London tracks to Gatwick airport. Through platforms at Baker Street would be freed up to become terminator/reversing platforms for the Circle/Hammersmith & City lines. Of course, I envisage running services through to Aylesbury again. 3. Chiltern Line. Running closely parallel to the Met is the Chiltern Line/Railway. An operational merger of the service to High Wycombe with the Met is possible, or it could continue to run in parallel. The former is perhaps preferable in order to maintain separate track for the Chiltern services running to Birmingham, which in fact is the remnant service retainging the Chiltern franchise. This scheme would see Baker Street cease as a Met LIne terminus, both lines instead diving into tunnel under Marylebone (already saturated) and on to south and southeast London tracks. 4. LTS/London Tilbury and Southend. Not a very long line, but a connection through the city and south London out to Dorking and Orpington is possible. 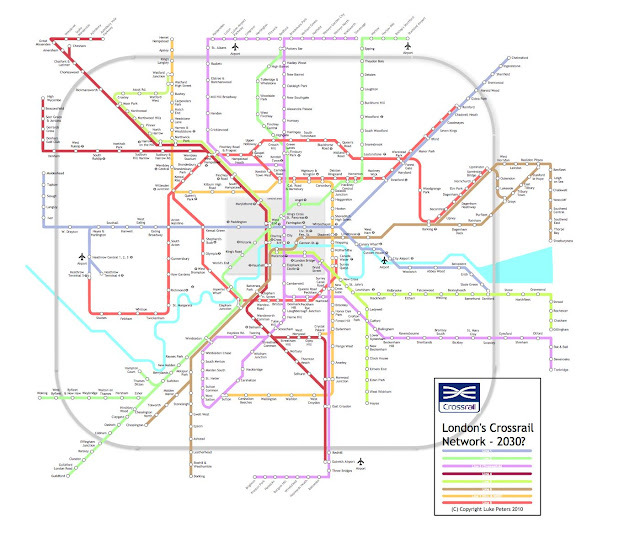 In the first version London Overground is integrated fully into Crossrail. Not the variation on the original Crossrail scheme. Instead of Bond Street, a Kensal Green station is included. This is now not feasible, since construction of Bond Street Crossrail is underway. The western extension otherwise remains the same, but the southeastern route to Abbey Wood is extended down to Dartford fr useful connections with other lines. In the second version London Overground is extracted and stands apart. Operation of the Metropolitan and Chiltern Lines remains distinct though they share routing from West Hampstead south as far as Charing Cross. The clicked map doesn't zoom open sufficiently to see enough detail. To see these maps bigger, Right click, then 'view image'. "To view LARGE VERSION, Left click on image, then right click 'view image'." Doesn't work - shame would love to see this image in a readable size. Agreed it would be interesting to see this as a readable image. Shame the author doesn't realise this. 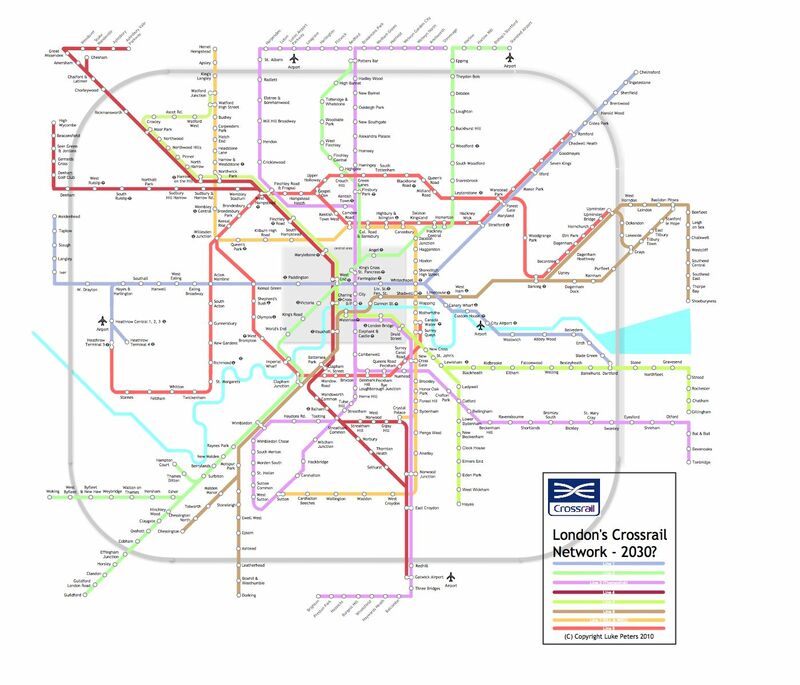 Have you considered the alternative of diverting the met line under regents park to connect to Crossrail at Bond street?